Do you enjoy math? I hope so! If not, browsing this post just may change your mind. Welcome to the 79th edition of the Math Teachers At Play (MTaP) math education blog carnival — a smorgasbord of links to bloggers all around the internet who have great ideas for learning, teaching, and playing around with math from preschool to pre-college. By tradition, we start the carnival with a puzzle, game, or trivia tidbits. If you would like to jump straight to our featured blog posts, click here to see the Table of Contents. Since I’ve been spending all my free time working on my upcoming Math You Can Play book series, I’m in the mood for games. So I found a few games featuring prime and nonprime numbers [which category is #79 — do you know? ], and I’ll sprinkle some of my best-loved math game books throughout the carnival. Math Concepts: multiples, factors, composites, and primes. Equipment: pair of 6-sided dice, 10 squares each of two different colors construction paper, and the game board (click the image to print it, or copy by hand). On your turn, roll the dice and make a 2-digit number. Use one of your colored squares to mark a position on the game board. You can only mark one square per turn. 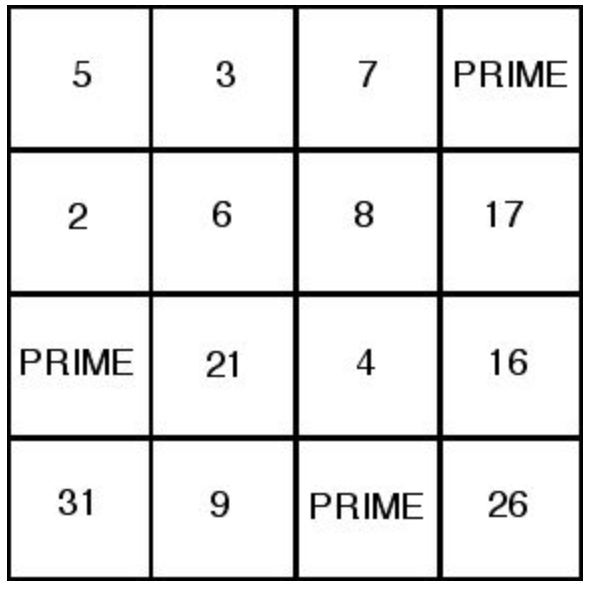 If your 2-digit number is prime, cover a PRIME square. If any of the numbers showing are factors of your 2-digit number, cover one of them. BUT if there’s no square available that matches your number, you lose your turn. The first player to get three squares in a row (horizontal/vertical/diagonal) wins. Or for a harder challenge, try for four in a row. And now, on to the main attraction: the blog posts. Many articles were submitted by their authors; others were drawn from the immense backlog in my rss reader. If you’d like to skip directly to your area of interest, click one of these links. Peggy Kaye gives parents more than fifty marvelous and effective ways to help their children learn math by doing just what kids love best: playing games. The answers to some math questions depend on how you define your terms, patterns, or ways of looking at the problem. Tabitha poses an interesting conundrum: Math in the Alphabet. Moaz invents a game for practicing basic addition and subtraction: Domino Number Bonds Game. Sadie Estrella’s niece tells how she knows fractions, because “Doubles are easy.” [TMWYK] Oranges. Somwrita Sarkar’s son marvels at the idea of a million lollies plus one more: What is the biggest number? This fun collection of cartoony illustrations, games, and creative activities offers a common-sense approach to mathematics for those who are slightly terrified of numbers. My entry for this month’s carnival continues our gaming theme with Horseshoes: A Place Value Game for all ages. 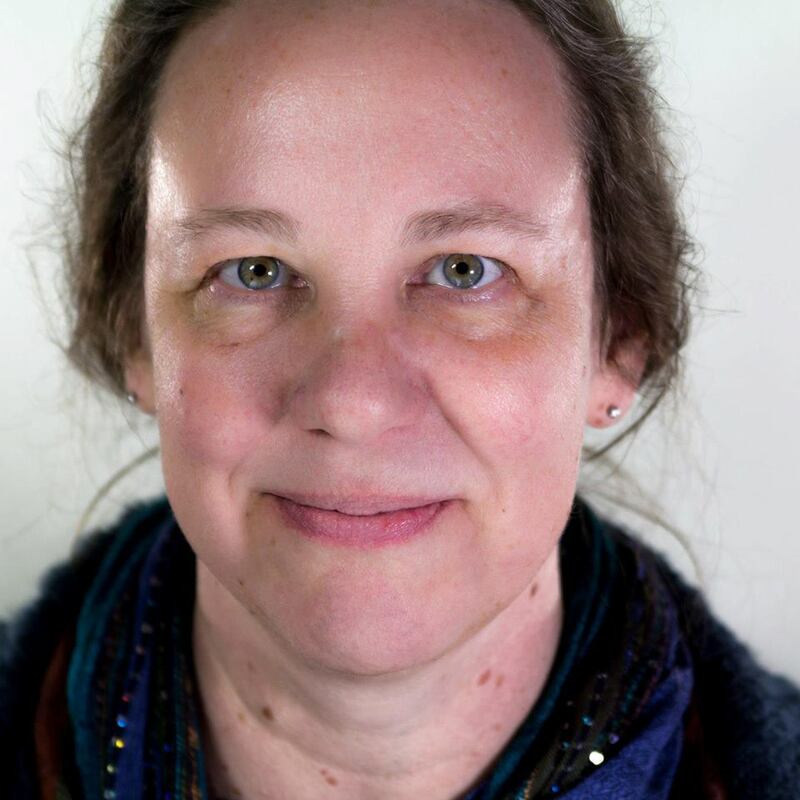 Maria Miller warns parents and teachers about the side-effects of a common practice: Should you use timed tests for math facts? Kelly shows how her family has fun with creative arithmetic in Math activity: The Counting Circle. I’ve enjoyed Julie’s posts on geometric doodling. Now her family is moving on to more “practical” geometry: Distance, Area, Volume Activities for Kids and Measuring Distance, Area and Volume. It’s not enough for kids to memorize and follow the steps of a math calculation. Tina Cardone shares her plan for building her students’ Number Sense, Logic, and Perseverance. Rodi Steinig’s math club students explore a variety of puzzles in Martin Gardner #3: Maze of Minotaur and Scrambled Boxtops. This collection of puzzles, games and activities is designed to stimulate and challenge people of all ages. Many of the puzzles have a long history, while others are original. Includes hints and solutions. Lisa Winer presents a mathemagic trick that gets her students’ attention every year in 1089 Math Magic Trick (and more). Can your kids explain why it works? Megan Schmidt challenges her algebra students with a deceptively non-algebraic-looking puzzle: The Un-Puzzle. Jennifer Wilson’s students tackle the big question of math, “How can we be sure?”, by proving conjectures about their Origami Regular Octagons. Cassie Cooper’s students rave over a lesson about the distance and midpoint formulas: Road Trip Across the USA. John Golden shares a wealth of wonderful “for cheap or free” resources for Algebra and Geometry in Such a Thing as Free. These mathematical recreations of paradoxes and paper folding, Moebius variations and mnemonics, both ancient and modern, will delight and perplex while demonstrating principles of logic, probability, geometry, and more. Kalid Azad looks at a problem from several perspectives to gain Intuition For The Law Of Sines. Shireen Dadmehr creates a game-like review lesson: Trig Identity Match Up Activity. John Chase presents his candy-corny Halloween worksheet for Calculus Students. “How can we count the ways?” is a more advanced question than most people realize. Egan Chernoff shares a video of one class working on Around the World (A Counting Problem Sequel). Keith Devlin tackles another counting problem and finds a huge difference between the (expected) abstract model and real world experience: Let’s Get Real About Math Word Problems. What does it mean to be “normal,” at least approximately? Bob Lochel’s students wrestle with the tricky problem of Assessing Normality in AP Stats. Having trouble convincing your students that correlation doesn’t actually correlate with causation? Explore the fun at Tyler Vigen’s Spurious Correlations. Most of these are beyond the scope of this carnival, but advanced students may want to check out William Wu’s Undergraduate Level Math Book Recommendations for Self-Study. And don’t miss the 115th Carnival of Mathematics. Entertaining diversions for players of all ages in which only pencil and paper are needed: old favorites and less familiar games. I can’t believe Dover let this wonderful book go out of print! Shecky Riemann pays tribute to a giant on whose shoulders we all stand: A Martin Gardner Sunday. Colm Mulcahy presents a collection of Five Martin Gardner eye-openers involving squares and cubes. Alex Bellos asks Can you solve Martin Gardner’s best mathematical puzzles? Mike Lawler & son tackle the question, “Could the Koch snowflake (another treat from Gardner’s Mathematical Games column) grow tall enough to reach infinity?” Another example of why I love teaching math to my kids. Gary Antonick is also Remembering Martin Gardner on this week of his 100th birthday. Likewise the BBC: Martin Gardner, puzzle master extraordinaire. And Pi Guy collects more tribute articles in 100 Years of Martin Gardner. Finally, Michael Lugo links to A list of fifteen books that make up Gardner’s “canon.” For a taste of the treasures they contain, check out Gardner’s own retrospective:A Quarter Century of Recreational Mathematics. Math, history, art, and world cultures come together in this delightful book for kids. More than 70 games, puzzles, and projects encourage kids to hone their math skills. Brian Stockus shares a simple but amazingly effective teaching tip in Numberless Word Problems. John Golden asks his elementary ed students think about What’s a Problem? Fun post, and the “gotcha!” in the area investigation made me laugh. Dan Meyer reminds us that there’s educational gold in working on “fake world” math problems: Real Work v. Real World. But then Ben Orlin points out several Scenes from the “Real World” Where Math is Useful. And Mike Lawler offers a potpourri of resources for anyone who really does want to have a better experience with math: Responding to David Coffey’s challenge. Book images are from Amazon.com, and if you click on a cover, the links take you to that book’s Amazon page, where you can read reviews and other details (and where I earn a small affiliate commission if you actually buy the book). But all of these books should be available through your public library or via inter-library loan. And that rounds up this edition of the Math Teachers at Play carnival. I hope you enjoyed the ride. The next installment of our carnival will open sometime during the week of November 24-28: MTaP 80 at Triumphant Learning. If you would like to contribute, please use this handy submission form. Posts must be relevant to students or teachers of preK-12 mathematics. Old posts are welcome, as long as they haven’t been published in past editions of this carnival. Past posts and future hosts can be found on our blog carnival information page. We need more volunteers. Classroom teachers, homeschoolers, unschoolers, or anyone who likes to play around with math (even if the only person you “teach” is yourself) — if you would like to take a turn hosting the Math Teachers at Play blog carnival, please speak up!